"I have been a Prosthodontist for 18 years. In that time, I have restored many smiles with many different types of dental materials. The Kahng Signature Implants with Layered Zirconia prosthesis we get from LSK121 is truly the most beautiful piece of dental art I have ever framed with lips. The strength of this material and your ability to bring it to life has created a restoration that fits perfectly in our comprehensive implant treatment planning. As a Prosthodontist, I expect every detail to be perfect in fit, form and function. I appreciate your lab and your ability to give my patients a smile that can transform their lives and exceed my expectations. Plus when it involves your mother, you know it has to be perfect!" "I relocated to Plano, Texas from Chicago 6 years ago and wanted to find a local lab to fit the needs for implant prosthetics. After using 5 separate labs that never met my expectations, I had to find someone with the expertise to deliver on the esthetics and durability I was looking for. I did a national search and found 3 labs that could deliver on what I was looking for, but LSK121 Oral prosthetics was the only lab that provided what I wanted with Kahng Signature Screw-Retained Zirconia. I took a chance and the whole process was super smooth. From verification jig to teeth try-in I had minimal adjustments. When the final prosthesis came back I was AMAZED! The tissue was life-like and the translucency and texture were spot on, even the occlusion was perfect. Three years later, my patients’ protshesis are still perfect. Now, I can sleep at night and not worry about chipping or popping off teeth. I trust LSK121 Oral Prosthetics so much, I did a Kahng Signature Screw-Retained Zirconia on my mother-in-law!" What Are Kahng Signature Implants? Master Ceramist Luke S. Kahng, CDT has dedicated his entire career to routinely creating the world’s most life-like and esthetically-pleasing restorations. Luke’s unmatched passion, dedication and commitment has led to the creation of the Kahng Signature Technique which is taught and utilized in his dental laboratory LSK121 Oral Prosthetics. His efforts have made him a highly sought-after educator and lecturer on issues related to tooth aesthetics, and shade matching technology and technique. Additionally, his dental laboratory remains at the forefront of milling and porcelain technology, and Luke himself serves as a key opinion leader for GC America. Luke’s technique (Kahng Signature Technique) combines the industry’s most innovative shade matching and milling technology with industry-leading porcelain techniques created by Luke S. Kahng himself. Kahng Signature Implants are the cornerstone of the LSK121 Oral Prosthetics dental laboratory providing doctors with the ability to provide their patients with a newer and better full-mouth option for their implant needs. These stunningly beautiful, exceptionally life-like and highly esthetic full-mouth implant prosthetics are the epitome of excellence in the art and practice of providing edentulous patients with a beautiful new set of teeth. They are hand-crafted with vibrant, GC America porcelain to contain realistic dentition including white calcification, crack lines, translucency, highly-detailed gum-tissue designs and other key factors that enhance and elevate the realistic appearance of your patients’ restorations. Kahng Signature Implants are an excellent alternative to traditional solutions for edentulous patients. They are easier to clean and maintain than traditional dentures. Additionally, Kahng Signature Implants are more stain resistant and retain their brighter, more life-like appearance much longer than traditional dentures. Kahng Signature Screw-Retained Layered Zirconia is a durable and aesthetically superior alternative to traditional dentures for edentulous patients. In addition to lasting longer in patients' mouths, Kahng Signature Implants are easier to maintain, requiring fewer visits to the dentist for cleaning and adjustments. After only 6-months of wear by patients, the superior quality and durability of Kahng Signature Implants by LSK121 is clearly evident. 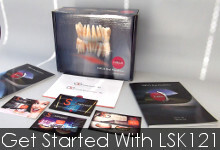 LSK121 Oral Prosthetics is an industry-leading innovator of Screw-Retained, Layered Zirconia implants having pioneered many of the techniques currently used and having already fabricated thousands of successful cases.